Heat oven to 350°F. Place tortilla on ungreased cookie sheet. Bake about 10 minutes or until crisp. Meanwhile, mix sugar and cinnamon. Place hot tortilla on cutting board; spread cream cheese on tortilla. Sprinkle with sugar-cinnamon mixture. Arrange fruit on top. Cut into 4 wedges. Serve warm. 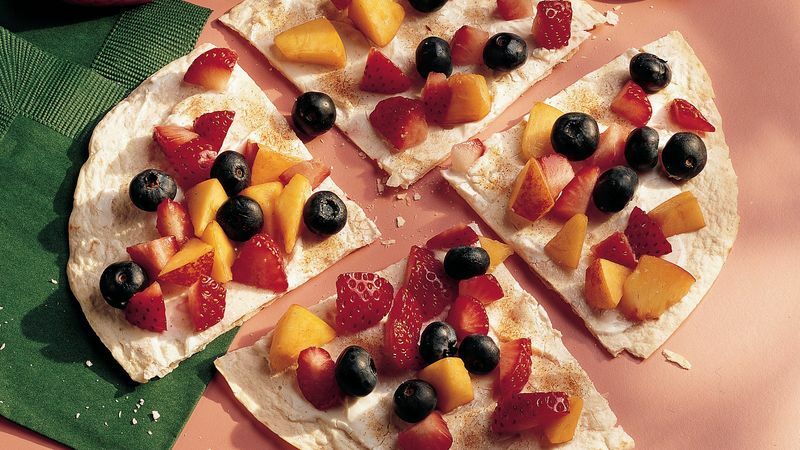 Spread a fruit-flavored cream cheese or honey-nut cream cheese on the tortilla for an extra perk to this ready-in-minutes dessert. Set up a toppings bar and let guests finish their own pizza with all the fixin's.